Matt Fletcher, left, and Rick Harlow, right. Spearheaded by Matt Fletcher from Atomic Object, the loose group of software professionals known as “Balanced Team” plan to share some of the techniques and methods they’ve developed to help foster diverse, cross-disciplinary project teams when they come to Grand Rapids this summer. There’s a group of professionals flying just under the radar, coming together when the time feels right; working to solve problems, refine techniques, break down walls. And they’re coming to your town this summer. Is this the upcoming “Avengers” movie we’re talking about? Nope; the group we’re talking about is completely non-fictional, and quite a bit larger in membership. They call themselves “Balanced Team” (cue dramatic music here). Balanced Team is a loose group of mostly software professionals who keep in touch via the web and the group’s mailing list, which has about 700 members. Matt Fletcher from Atomic Object is perhaps the group’s “leader” in Grand Rapids, but Balanced Team is an organic, spontaneous group whose primary aim is to maintain a conversation on challenges and solutions in design and teamwork, and let different members take the reins when it’s appropriate. And before you tune out because you don’t have the slightest connection to the world of software: The group is growing quickly, and increasingly looking to incorporate members from a wide variety of other fields and backgrounds. Matt FletcherBalanced Team’s mission isn’t written down in a “definitive version,” but it essentially comes down to this: They work together to learn how to create “balanced teams” of professionals from multiple disciplines to tackle projects and challenges in the workplace (and maybe even beyond — they’re not big on boundaries for their ideas). Members of Balanced Team, many of whom are based in the Midwest but with some coming from as far as Los Angeles and the United Kingdom, tend to plan at least one major “summit” event each year, and this year’s version arrives in Grand Rapids this summer. The 2015 Balanced Team Summit will take place from June 13-14, primarily at The Factory on W. Fulton St. Interested parties can register now for the summit via the conference website. Tickets cost $150, plus a small convenience fee. So what takes place at a Balanced Team summit? Fletcher says the events are mostly designed to foster conversation and idea exchange between members; to that end, there’s plenty of open space and time for unscripted interaction. However, it’s not all “loosey-goosey time,” as Fletcher puts it; the group does poll members before a summit to tease out possible themes and get ideas for potential guest speakers and topics. The Grand Rapids summit will probably be divided half-and-half between scripted events and speakers and time for open-ended conversations, Fletcher says. The difference from most professional conferences is that Balanced Team events take great care to break up the usual distinction between the speakers and organizers, and the attendees. For example, the group often features their guest speakers in “fishbowl” conversations, where four chairs are arranged in the center of a seating arrangement, with three presenters occupying three spots and the fourth chair remaining empty. When someone from the audience feels like they have something relevant to add to the conversation, they come up and occupy the empty seat in the center. The expectation is that, within a few moments, someone from one of the other chairs will get up and leave the inner circle, allowing the conversation to gradually cycle through everyone who wants to speak to the topic. And even the topics tend to be open-ended: Fletcher says that on the first day, conference attendees usually write down on sticky notes the challenges or techniques they’re most interested in discussing, then post them and vote on each other’s suggestions. The organizing team uses the voting to tease out a few key topics of interest and divide the conference into different areas addressing each of these issues. The history of Balanced Team, as far as Fletcher knows it, goes back to an Agile conference he attended with other members of Atomic Object in 2007. He noticed a sort of “side conference” going on of about a dozen people, with “people talking about ‘this Balanced Team thing,’” as he puts it. A few bigger names in software, like renowned programmer and author Alan Cooper were already involved, which impressed Fletcher off the bat; he wanted to find out more immediately. According to Fletcher, Balanced Team has steadily added members every year; they’re now aiming for perhaps a hundred attendees or so at the Grand Rapids summit this summer. Fletcher shares a few of the favorite techniques he’s learned at Balanced Team events that he applies at Atomic Object; he’s a big fan of “story mapping”, which involves visually organizing a project or task into larger themes or components with, say, sticky notes on a wall or table, then using smaller entries underneath to break down these large-scale needs into smaller components or tasks (it’s easiest to understand if you follow the link and watch the video). Software companies often use story mapping to plan out a product release, but like most of the techniques shared at Balanced Team, the overall idea can translate to almost any field, Fletcher says. For example, Atomic Object used a story map to plan out the opening of their expansion offices in Detroit and Ann Arbor. Another favored technique at Balanced Team, according to Harlow, involves creating “personas” — profiles of potential end-users, either fictitious or based in reality, that project workers can look at to guide their decisions and think outside their own personal preferences. 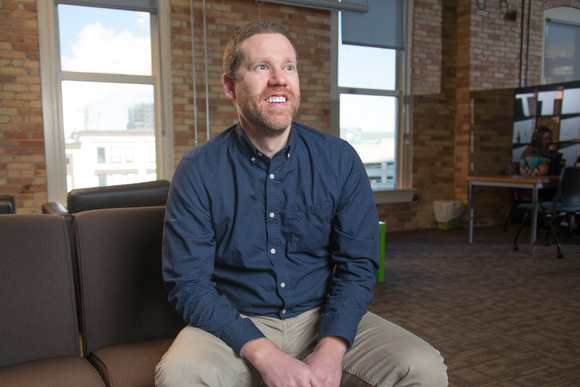 One Balanced Team enthusiast that Fletcher attracted from outside the software world is Jon Carfagno, the director of learning and audience engagement at the Grand Rapids Art Museum. Carfargno, who worked with Harlow to create a new strategic plan for the museum based around user-centered design, will present at the Balanced Team summit this summer, discussing ways that GRAM applies user-centered design and other philosophies that feed into the overall Balanced Team concept in devising art exhibits, collection content and marketing campaigns. The 2015 Grand Rapids summit will push the boundaries of Balanced Team even a little further with an overarching theme they refer to as “Balanced Teams Everywhere”: specifically, how to integrate the concepts behind Balanced Team into digital, web-based interactions and complex, collaborative projects that may span multiple offices, teams and locations. Fletcher says he’s not just excited to meet up with like-minded compatriots and get the latest updates on Balanced Team concepts, their evolution and stories of real-life applications. 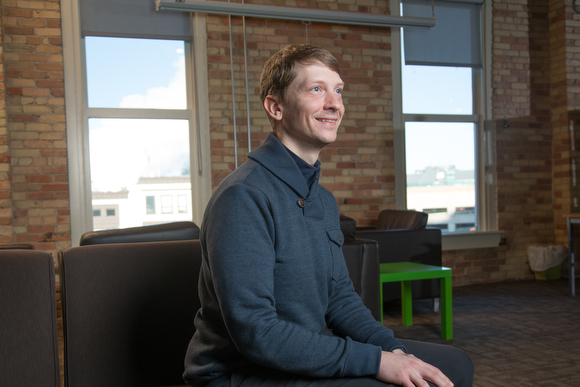 He also wants to show off Grand Rapids’ fast-growing tech scene and some of the changes he’s seen in the city since the last Balanced Team event in GR in 2010. Steven Thomas Kent is the editor at Roadbelly magazine and a high-tech, high-growth features writer at Rapid Growth Media. You can reach him on Twitter @steventkent or e-mail him at steven.t.kent@gmail.com for story tips and feedback. His stories are made possible by support from Emerge West Michigan.